Introducing Cress, a new addition to the team! A retelling on Rapunzel, Cress has been in orbit in space for as long as she can remember, helping out Queen Levana. She's had enough, though. And she has decided to help Cinder instead. Out of all three girls, I think Cinder is still my favourite. To me, Cress is like the sweet girl of the group. She is that ray of sunshine whereas Cinder and Scarlet are tired and wary of the world around them. It's no wonder that Thorne fell in love with her. Their relationship developed steadily throughout this book, and it's one of the strongest bonds out of those that exist. But both sides are trying to hide it desperately. 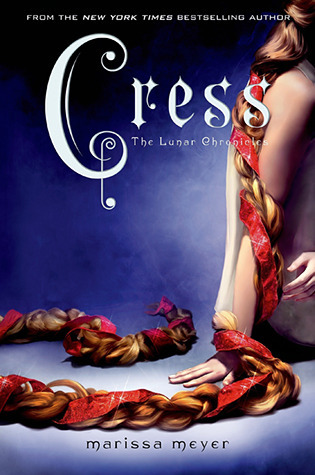 At first, Cress was openly in love, until she realised Thorne wasn't the person she thought he was. She still loves him, despite everything. We don't see much of Wolf and Scarlet, and neither do we see much of Kai and Cinder. I really ship Kai and Cinder, so I hope all goes well for those two. Wolf and Scarlet are a cool couple - they're more badass and tough than lovey-dovey though. In this book, we get a glimpse of Winter and Jacin. Their relationship I'm skeptical about, but I'm sure Meyer will be able to spin a cute love story behind them. Winter is kinda crazy from not using her Lunar powers, but I respect her for making this decision.